BBC Radio 3 - Music Feature, Why Do Women Die in Opera? Journalist Martin Kettle considers why in the most popular tragic operas the sopranos, and occasionally the mezzos, meet a gruesome end. 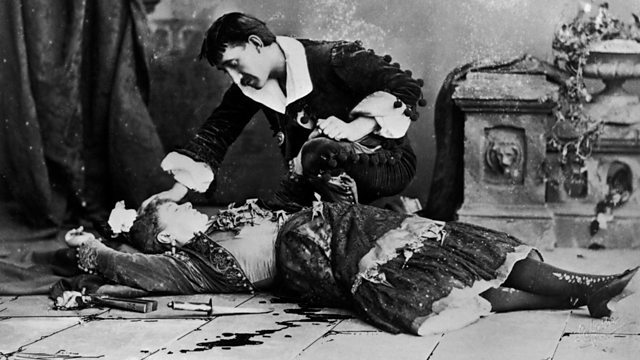 Where would opera be without dead women? Associate editor of the Guardian and opera fanatic, Martin Kettle, considers the fact that, be it through suicide, murder, asphyxiation, drowning, execution, consumption, leaping off a balcony or dying in an avalanche, when it comes to the most popular tragic operas, to a disconcerting extent it's the sopranos, and occasionally the mezzos, who get the chop. Together with singers Natalie Dessay and Christine Rice, singer/director Catherine Malfitano, director David McVicar, ENO music director Edward Gardner, The Royal Opera House's director of opera Elaine Padmore and scholars Peter Conrad, Susan McClary and Margaret Reynolds, Martin considers the social, historical, political and artistic contexts in which to understand the dying operatic heroine in canonical operas including La Traviata, Tosca, Madame Butterfly, La Boheme, Carmen, Manon, Tristan and Isolde, the Flying Dutchman, Tannhauser, Gotterdammerung, Salome, Elektra and Lulu. He looks at how composers' own relationships with women might shed light on their dying divas and he weighs up a certain feminist approach to nineteenth century tragic opera which presents death as a punishment that the female romantic lead is required (by a 19th century bourgeois audience) to pay for living too passionately.